"Super Search" comes to the Recorder/Register tabs. For just a little over a month now, "Super Search" has been available to folks searching under the Court Record and Tax Warrant tabs. 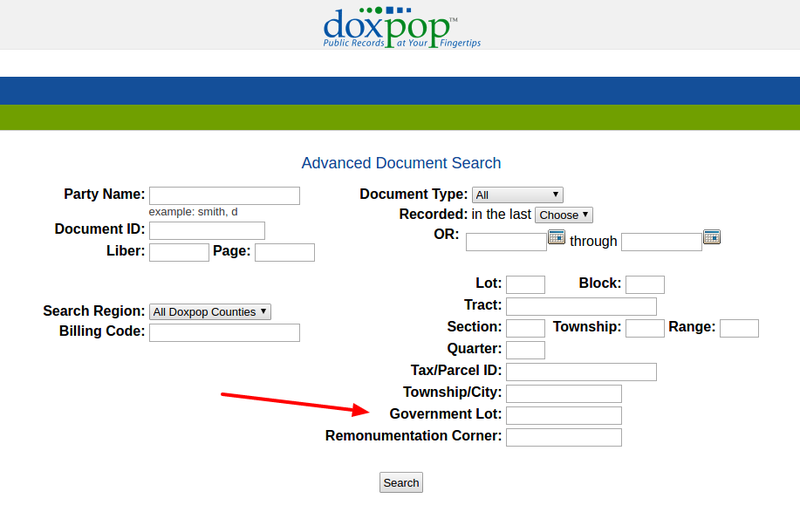 On Monday (4/24), we are adding Super Search to the tools available in the Recorded Document & Register of Deeds tab. For people who are used to using the traditional search, it is important to know that you can turn the super search on or off using the check box. Your search setting is "sticky", meaning it stays on whichever type of search you selected until you change the setting. If you have several rush orders to do today and don't want to learn a new search tool, just leave the box un-checked and get on with your day. However, if you've got a few free minutes, give it a try. Super Search can make your job a lot easier once you get used to it. For complete details about how super search behaves, take a look at this blog post from February 28. Coming Soon: Keep an eye out for an announcement about "Full Text Search" soon. This new feature will allow you to find documents by searching for keywords found in the document- even if they aren't part of the index! Change in e-filing subject lines: "Filing Submitted" becomes "Notice of electronic filing"
A few people have called us in confusion today, because the subject line for notification that a submitted filing was received has changed (again). 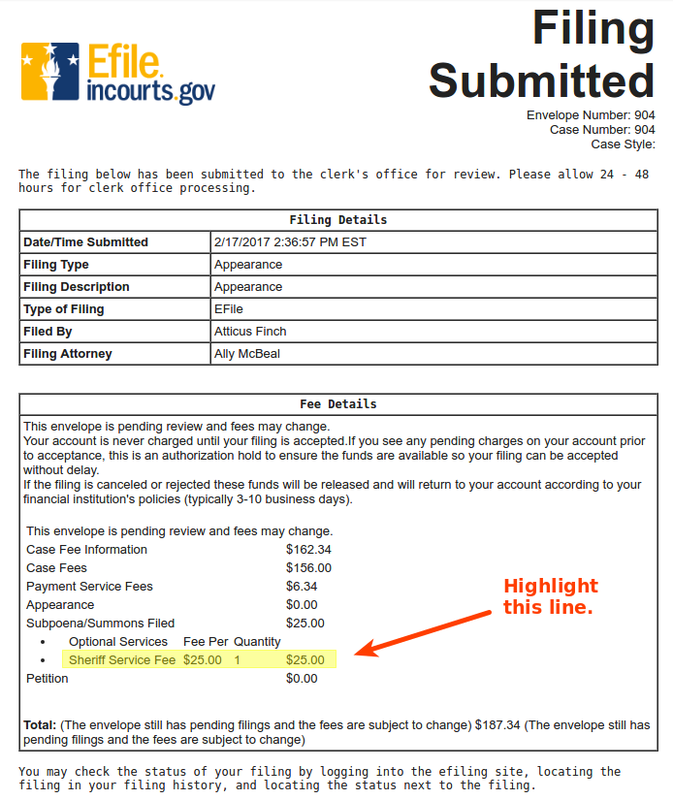 These emails now have a subject line beginning "Notice of electronic filing...", and in the upper right corner of the email, the big bold title says "Notice of Electronic Filing" as well. Don't worry, it's the same thing as the emails that used to say "Filing Submitted". This is the second time the subject line of these emails has changed, but we really like this change, because now the subject line matches up perfectly with the terminology used in trial rule 86(E), which says you should retain "each Notice of Electronic Filing". 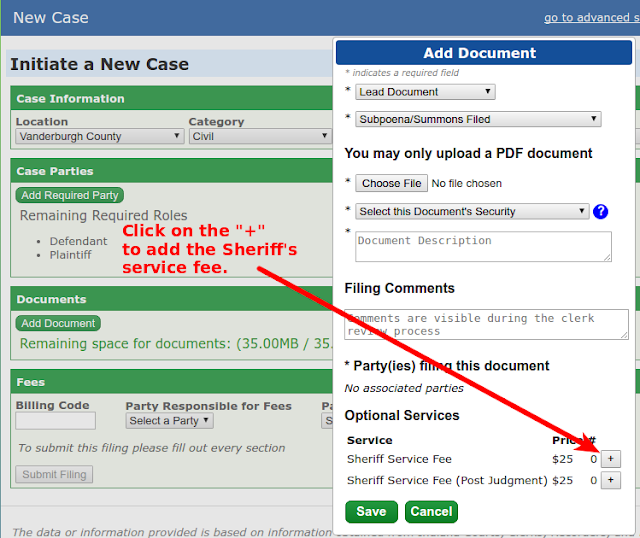 Vanderburgh service payments, and how to make sure the Sheriff knows you paid for service in any county. How to prove to the Sheriff that you paid the fee. As always, please feel free to give us a call if you have any questions about this or any other aspect of e-filing. Call 866-369-7671 or email support@doxpop.com. We are here to help. There are a couple of support requests that we receive regularly now that e-filing is well under way. The first is help with locating sample forms. The second is what the local rules and processes are when they vary from the basic rules outlined at the state level. We'll list the resources we've found for both of these below. To find what you need quickly, user your browser's "search in page" function (usually Control-F) to search for a county or keyword for a document. We'll update this post as we come across new resources, so bookmark it as a reference moving forward, and please let us know if there's a resource we should add. As a general rule, remember to never combine more than one document in a single PDF file. Many older forms combined several documents, and that makes it hard for the e-filing system to route them correctly. Forms created by Richard Mann. Our searchers in Iosco County, Michigan have been using a field as part of their title research called Government Lot that designates a legal description as being waterfront property. 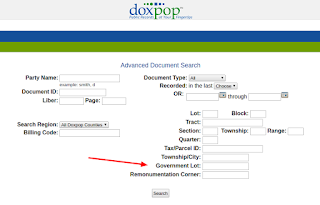 When the Register of Deeds switched to CSI and Doxpop for their county, the field was entirely new to our systems. We're happy to have this field available now, both as a searchable field and as part of the legal description we display to make sorting parcels of land easier for those users. Thank you to all of our new partners for your patience in getting this added, and please let us know what else we can do to make your research process work more efficiently!